The three-year retreat in the form we know today goes back to Jamgön Kongtrül Lodrö Thayé. It is based on the yogic tradition of retreat of the Nyingma and Kagyü lineages. Nigu Drubkhang where Shangpa teachings were practiced, including the Six Yogas of Niguma. Nigu Drubkhang was located at Tsadra Rinchen Drak, ’the Jewel Cliff which resembles Tsari’ — the sacred site above Palpung Monastery. 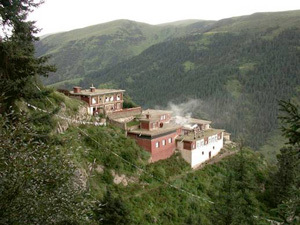 The site also became Jamgön Kongtrül Lodrö Thayé’s main residence, where he wrote most of The Five Great Treasures, as well as becoming the new seat of the Shangpa Kagyü tradition. It is considered to be one of the twenty-five holy places of east Tibet (mdo khams), representing the mind aspect of enlightened qualities. Chokgyur Dechen Lingpa revealed the sacred site in 1859 and both he and Tertön Sogyal later revealed termas from its hillsides. Situ Panchen Chökyi Jungné had founded a retreat center and monastic residence there in the eighteenth century but when Jamgön Kongtrül first visited the site in 1842, it was completely abandoned and in ruins. Jamgön Kongtrül restored a small hermitage for himself there and started a personal three-year retreat. He later built a small temple dedicated to Yangdak Heruka, following Chokling Rinpoche’s revealed prophecy and advice, as well as a retreat center, with the intention of leading three-year retreats in the spirit of the Rimé tradition. The first three-year retreat designed and led by Jamgön Kongtrül started in 1860 with five retreatants. Three-year retreat cycles continued uninterruptedly until Kalu Rangjung Künchab — the retreat master there since 1941 — fled to India before the Chinese invasion in the mid 50s. The centre was completely destroyed during the Cultural Revolution. It was later rebuilt in the 80s, under the guidance of Kalu Rinpoché and the Third Jamgön Kongtrül. 1988 marked the new start of continuous three-year retreat cycles. Later, thanks to the great activity of Kyabjé Kalu Rinpoché, many three-retreat centers were founded in India and around the world, revitalizing the tradition and ensuring its continuity. From the time of Jamgön Kongtrül, the Shangpa lineage has been mainly taught and practiced in the three-year retreat centers.